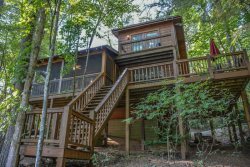 This two bedroom, one bath cabin is a unique and quaint cabin built in the woods, on a creek close to nature. The beautiful creek running along the edge of the property offers year round relaxation as you enjoy a cup of morning coffee on one of two decks that overlook the rolling water in the creek. Throughout your stay, enjoy listening to the birds, the sounds of the creek, sitting in the hot tub, cooking on the gas grill or outdoor fire pit or just visiting with family and friends on the spacious decks. This cabin is made for relaxing. A gas log fireplace offers a warm glow to both the dining area and living room. The living room has a Flat Screen TV with cable and the house has free Wi-Fi. This cabin is located in a quiet rural area rather than a resort with cabins built on top of each other. The natural yard slopes down to the water to offer places for wading and playing in the creek. It is also located near many of the wonders of the North GA Mountains such as tubing or paddle boarding on the Toccoa or Ocoee River’s, zip-line, hiking on one of many trails, visiting the many waterfalls, water sports on Lake Blue Ridge or a trip to the Swinging Bridge, we have it all. You can also enjoy shopping in Blue Ridge and McCaysville or indulge in one of the many wonderful restaurants. Nearly every weekend in Blue Ridge or McCaysville there is a special event, parade or festival. Come to the mountains and find your perfect. Perfection! Everything about our stay at Creeksong was first class. From pre arrival communication, the quality and location of the cabin - we could not speak more highly. Stayed here for Christmas . And we will be back . Mountain Laurel were excellent and we will definitely use them again. We loved the cabin! It is an awesome getaway trip. The responsiveness of Mountain Laurel Cabin Rentals was above and beyond as well!! A wonderful, cozy and secluded cabin. So nice to come in on a private road with a beautiful stream in the backyard. Comfortable beds and very clean, We loved everything about it!! Everyone at Mountain Laurel Cabin Rentals was extremely nice, thoughtful and helpful. They were very accommodating and helped us choose the perfect cabin. After staying in the cabin twice in the last 6 months, we like to think of it as our little getaway. It has been a great place to rest, relax and just breathe...the perfect romantic retreat for our fast paced lives. Thank you so much for allowing us to enjoy such a special place. My husband and I had such an amazing stay at the Creeksong cabin rental! We loved getting in the hot tub and relaxing at night - while listening to the river, and enjoying a nice glass of wine. The screened in porch was perfect for that morning cup of coffee and the view of the river couldn't be better! It was hard to say goodbye to this gem, we had a blast and we can't wait to go back! The cabin was beautiful and peaceful. We enjoyed sitting on the screen porch listening to the river. The hot tub was relaxing and the kids loved it. Perfect Getaway! Peaceful, relaxing, secluded and easy access to many hiking trails. The river is amazing! Loved downtown and the restaurants.. Masseria and Serenity Gardens- Yum! We will be back! The screened-in back porch was amazing. We enjoyed sitting out there in the mornings and evenings to just 'be' and listen to the sounds. After a day of hiking around some of the Blue Ridge trails, the hot tub was the best amenity.